Not that long ago, manufacturers were somewhat wary about discussing the topic of automation—and for good reason. Back then, analysts were predicting that automation was poised to displace millions of jobs and threaten the very foundation of society. In fact, today in the United States, there are more than seven million jobs going unfilled, with virtually full employment in the labor market. 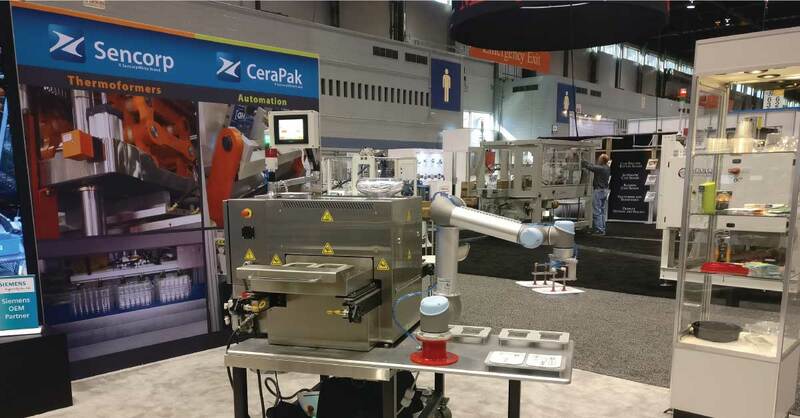 And I just returned from the 2018 Pack Expo International show in Chicago where virtually everyone I spoke with was talking about—you guessed it—automation. The SencorpWhite CeraTek tray sealer integrated with a Universal brand collaborative robot. Integrating a robot allows SencorpWhite’s tray sealer to run unattended, automatically. Just a few short years ago, companies shunned integrated automation like this because they could not justify the cost versus hiring a low-skill machine operator. “The payback just isn’t there,” they told us. But today, many manufacturers’ machines sit idle because there’s no one to run them—which means now, there’s ample justification to automate. Our CeraPak automated packaging systems group. In addition to exhibiting our CeraTek, Accu-Seal, and Sencorp product lines, we also reintroduced our CeraPak automated packaging systems group. CeraPak automated sealing systems can be found in diverse global markets, ranging from consumer and medical packaging to life science and energy product manufacturing, and our renewed emphasis on custom configured automation is in direct response to increased interest in integrated systems within these verticals. Our CeraPak systems can automatically form and feed formed blisters or clamshells, load product, and then seal and collate the packages. With integrated OEM-provided equipment, the packaged product can also be carton- and case-packed. Each system is manufactured to order, configured to meet customer requirements, and recognized as robust, flexible, and dependable with high throughput and quick changeover features. It’s clear that the skilled labor shortage is real, as is the need for automation. Fortunately, SencorpWhite is here to meet the demand, and you can rest assured that our team will find a way to custom-fit a solution that will solve your needs now and scale as you grow.